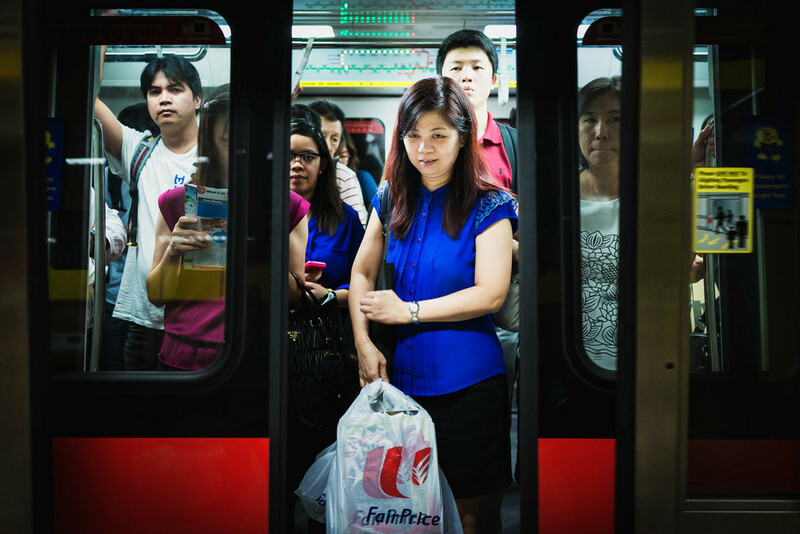 Transit is a project based on the intra-city railway system of Singapore, the Mass Rapid Transit (MRT). Built in 1987, it is used by 2.8 million people daily. 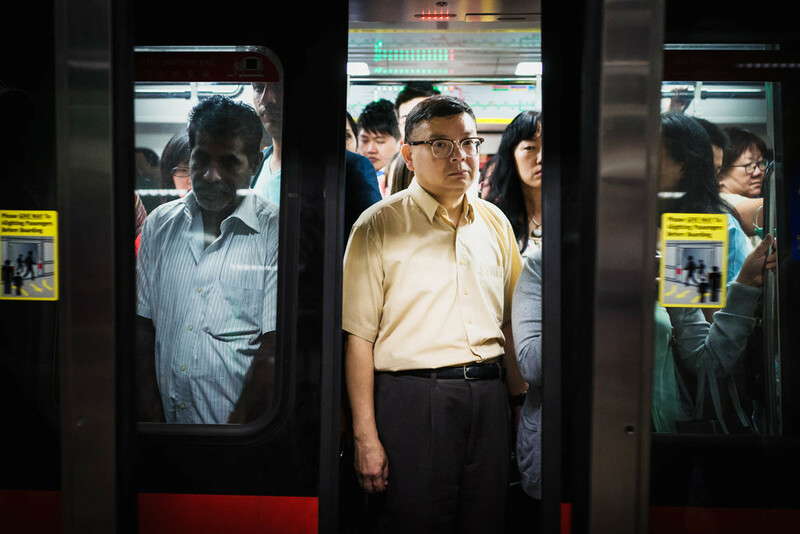 Using photography, photographer Edwin Koo paints a collective portrait of commuters, capturing the daily theatre that the eye fails to see. 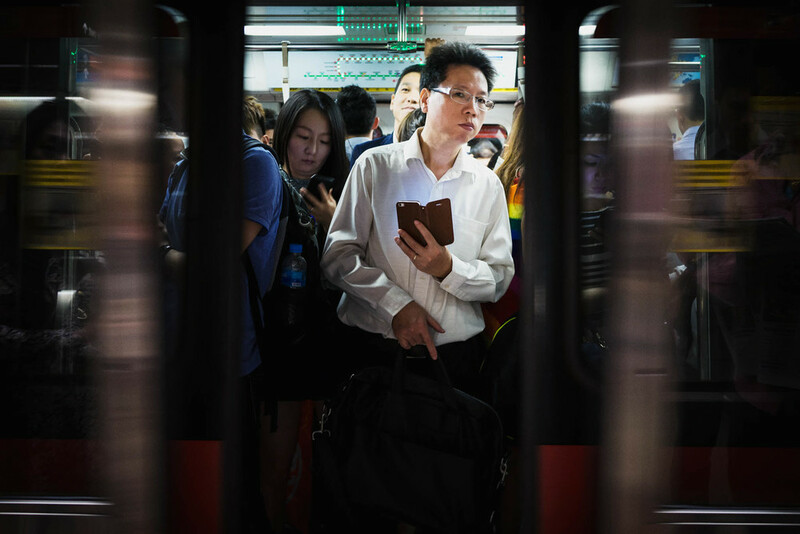 As commuters today, we distract ourselves endlessly with our smartphones or iPads, to anaesthetise ourselves from the unnatural and uncomfortable experience of transit. We create private spaces for ourselves in the most public of spaces. 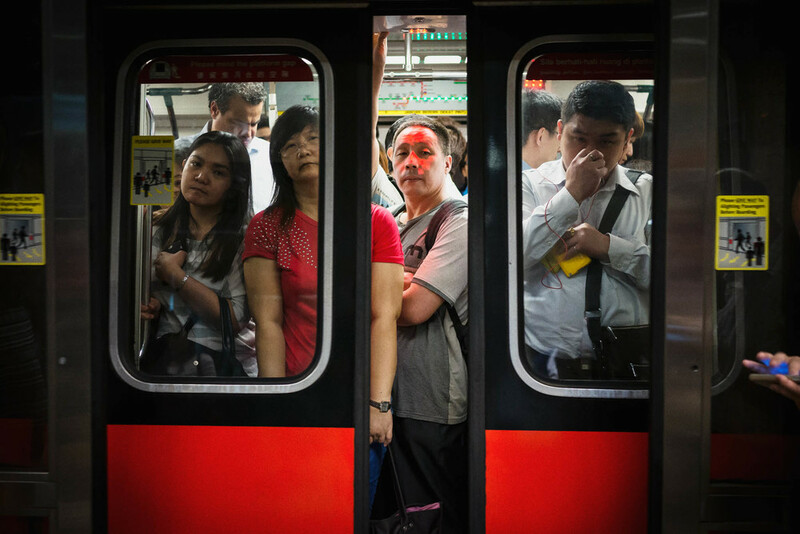 As commuters, we observe an unspoken rule not to stare at each other’s misery. As a photographer, I broke that last rule twice over – I recorded the stare, and continue to be amazed by what the stare reveals. 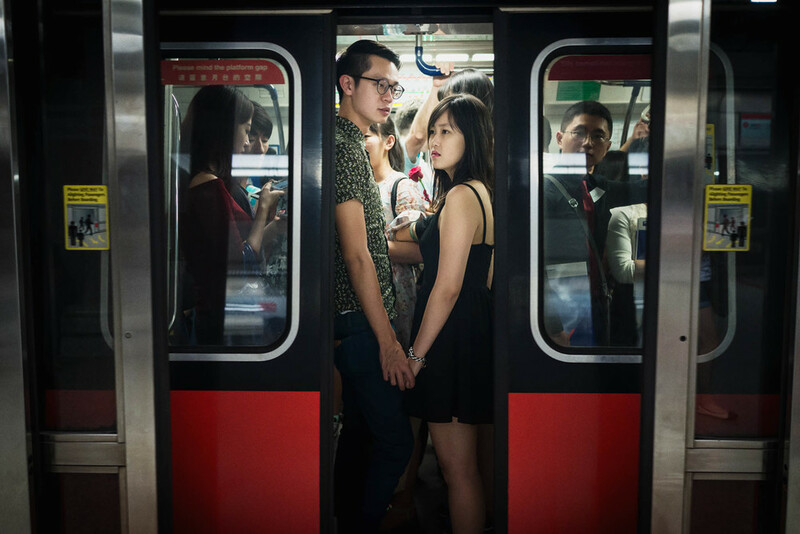 What is the first thing we do when we step into the train? Is it a place we want to go to, or a place we have to go to? We create private spaces for ourselves in the most public of spaces. Her damp strands of shampooed hair fell reluctantly on my forearms. I peered over her shoulder helplessly, reading the Whatsapp messages to a certain Randy, aboutthe soap series Friends. All the while Samsungs and iPhones beeped ceaselessly, sending barrage after barrage of Facebook notifications and radiation. 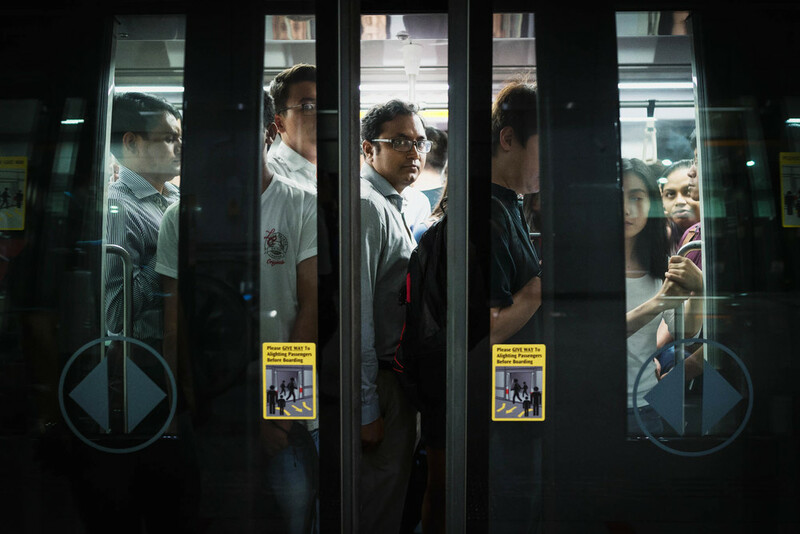 The train squeaked to a jerky halt at Paya Lebar. I struggled to find the bar, to keep my balance. Once again, the doors clanked open, releasing the shampoo scent as well as the horde of strangers, along with their infernal weapons - the smartphones and the tablets that took up what little reading space there is between us all. A theatre unfolds with each set of opening doors. A new set of actors, a new story. The doors close, another curtain-fall. No applause, no encore. Another set is already rolling in, 3 minutes from now. The actors on the stage may not be you or me, but they are very much a reflection of you and me today.